There are a variety of accessories and auto parts that truck enthusiasts can add to their vehicle to give it a more rugged appearance, such as grille guards, truck racks, tonneau covers and bed rails. Each of these accessories also offers better protection for specific areas of your truck. Furthermore, certain auto parts also better protect drivers in collisions or minor accidents involving animals. Explore the benefits of four popular truck accessories and auto parts, below. Adding a grille guard to your truck is a great way to upgrade your truck’s appearance while enhancing its functionality, too. Grille guards prevent your vehicle’s front end from a variety of scrapes and dings caused by rocks, gravel and more. 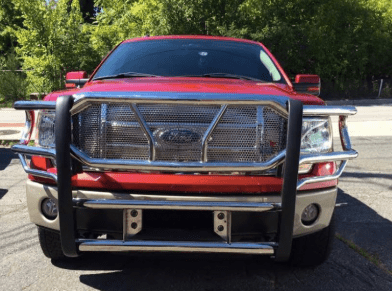 A grille guard, otherwise known as a bull bar, is custom-designed for a particular vehicle, meaning that not only will they match up specifically with factory mounting positions, they will also fit precisely to a vehicle’s front end. When researching options, be sure to select your vehicle’s specific year, make, and model. They also may also prevent injuries during an accident with another vehicle or when hitting an animal (Auto Accessories Garage). As far as installation goes, most grille guards use factory mounting positions located below the front bumper, allowing users to bolt on easily with no cutting or drilling required. They usually work with other truck accessories, like tow hooks. They allow you to add additional lights to your truck such as fog lights, and off-roading lighting elements. In minor accidents, they protect the front end of your vehicle. Although you may scratch your grille guard, it’s probably a better alternative than causing damage to the front portion of your truck itself. A truck headache rack, (truck rack, backrack, cab protector – as they are called in different parts of the country) helps protect a driver’s window from objects in the bed of their truck. They also allow truck drivers to add additional cool lights and a more rugged appearance to their truck. The most common design for a headache rack is a vertical frame made of metal such as aluminum. Its traditional purpose is to keep cargo in the bed from going through the cab’s rear window and striking the occupants in the event of a front-end collision. Modern truck racks are also used to hang various pieces of equipment, especially for commercial vehicles. Magnum truck racks are available in a range of styles, depending on its specific purpose, with all models ruggedly built to withstand harsh treatment from weather and cargo. The Standard Truck Rack is the most versatile and is designed for general use. It has a glide track for easy installation of lights and other Magnum’s truck rack accessories. The Standard Truck Rack is also available with a window cutout to allow an unobstructed view through the rear window. The Low-Pro Truck Rack has a lower profile that adds to that factory look. A wiring harness provides this truck rack with backup lights, brake lights and signal lights. The Low-Pro Truck Rack is made of aluminum, with MIG and TIG welding for maximum durability. The High Pro Truck Rack is for truck owners who want a truck rack with greater functionality. It has a higher profile than the Standard Truck Rack, while still providing the same style. Tonneau covers are used in pickup trucks to secure cargo in the truck bed area. Benefits to installing a tonneau cover include protection from weather elements such as snow and rain, as well as security against theft. Add on auto parts like tonneau covers also enhance the appearance of a vehicle for truck enthusiasts. When purchasing a tonneau cover, you’ll find there are several different types. Common tonneau cover choices include roll-up covers, retractable and hard (fiberglass or aluminum) options. Roll-up Tonneau Covers: Roll-up covers are generally the least expensive tonneau cover option. They’re also easy to install and require no drilling. Roll-up covers are made from a soft material, usually consisting of vinyl or cloth. Retractable Tonneau Covers: Retractable tonneau covers are more durable than roll-up versions. This cover requires a semi-permanent installation, where the unit is mounted at the front of the bed as well as the sides. Retractable tonneaus are made of vinyl or aluminum materials and thought to be more secure and long-lasting than soft tonneau covers. Hard Tonneau Covers: A hard tonneau cover is made of aluminum, fiberglass or some composite material. These covers are more sturdy and long lasting. They can be locked which allows truck drivers to secure their cargo when they truck is unattended. Hard tonneaus require a more permanent install, however; if you’re looking to avoid drilling into your truck, this is not a good option for you. Hard covers are also the costliest of the tonneau cover options. If you’re looking to upgrade your truck’s appearance and functionality, truck bed rails are a great way to do it. Bed rails are auto parts that allow truck owners to easily tie down cargo in the bed area. They also help secure long or oversized items that need more reinforcement than the truck rack can provide on its own. Whether you use your truck every day to haul equipment, or you’re looking to add some style to your ride, bed rails are a good option. Magnum bed rails require zero drilling for installation. They’re also customized specifically for the make and model of your truck, ensuring they’re a perfect fit. Although most truck beds appear to be similar in size, the stake pockets that bed rails are mounted to are often located in different places depending on the specific type of truck. • Securing a common piece of equipment to your truck, such as a latter. • Transporting a items in the bed of a pickup, without worrying that it may tip over or move around while the truck is moving. • Protection for the side rails of your truck; no more unsightly dings, scrapes and missing pieces of paint.